Springtime Fun! 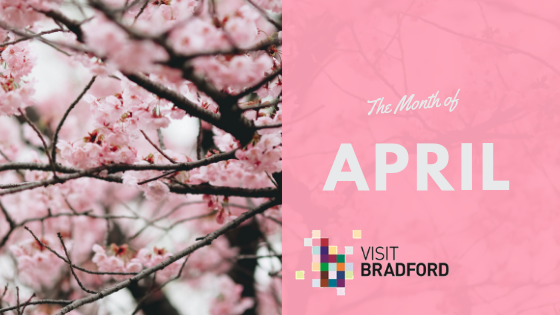 Plan your month with our events calendar of the very best events and activities in Bradford & District. Celebrate English Tourism Week 2019! Celebrate the start of England’s spring season with a day out or microgap during English Tourism Week (30 March – 7 April 2019). Enjoy some tasty treats at Haworth’s Artisan Food and Drink Market. (Saturday 6 April, at the old School Room) Showcasing some fantastic local produce from cheese and chocolate to spices and spirits, there will be something for everyone. Make a day of it, Haworth is a great place to visit with many local attractions and museums. Take a tour of Undercliffe Cemetery on Saturday 6 April. Bradford’s Victorian photographers, artists and entertainers. Find out about some of Bradford’s best-known photographers at Undercliffe, they not only took photos but got involved in film making and introduced X-Rays to local doctors for the very first time. The Bradford Faith Trail a one-mile stroll along Leeds Road takes you on a voyage of discovery. The trail includes St Peter’s Roman Catholic Church on Leeds Road; the Abu Bakar Masjid (mosque); the Shree Lakshmi Narayan Hindu Temple; the Guru Gobind Singh Gurdwara; and then the Bradford Cathedral. Real Food Ilkley at South Hawksworth Street on Sunday April 7 (10am to 3pm) The open-air market celebrates the rich variety of locally produced food and drink. Come along to the classic car meet at the Woolpack, Esholt. Held every second Wednesday of the month, from April to September. You’ll find many classic, vintage and supercars. Modern classics and old-timers, bring your own or admire everyone else’s. It’s a chance to talk about all things motor related. New exhibition at the Cartwright Hall (From the 10 April) ‘We are West Yorkshire: Bradford People’. Features a selection of artworks and social history items from the gallery and museum collections portraying people of Bradford, celebrating the district’s talents and inspiration. Dance fans are invited to Saltaire Day of Dance (Saturday, 13 April). A fantastic day of over 30 diverse dance and music/singing workshops, plus an early evening Ceilidh for everyone of every age. Our Hotpick! Let’s all go to Saltaire to celebrate World Heritage Day Saturday 20 April. Visitors can step back in time and explore the fascinating history of Saltaire. Head to Roberts Park for live music, Shakespeare Comedy Mashes performance and lantern parade organised by Cecil Green Arts. The smash-hit production of Annie comes to Bradford for one week only (22-27 April) direct from London’s West End. This ‘glorious revival’ (The Times) stars award-winning actress Anita Dobson (Eastenders, Wicked, Loose Women, Chicago, Call The Midwife) as the tyrannical Miss Hannigan! Believe in the power of love: Ghost the Musical – Based on the phenomenal Oscar® winning movie that captured the hearts and imaginations of a generation back in the 90s, Ghost the Musical is a timeless fantasy about the power of love and is coming to the Alhambra Theatre as part of a brand new UK tour from Tuesday 30 April – Saturday 4 May 2019. Join Bronte Bars for the 8th Annual Haworth Beer Festival where you’ll be able to sample over 35 Real Ales, Ciders and Lagers alongside ‘Branwell’s Gin & Rum shack offering the latest spirits on the market on Friday 26 – Sunday 28 April. New Exhibition: Local Artist Martin Cosgrove: Fresh Horizons solo exhibition of oil paintings at Bradford Cathedral. (From 27 April) Abstract land and seascapes painted in oils inspired by the incredible beauty of the country in which we live. For Easter holiday tips and ideas for family days out during the school holidays, browse our guide to what’s on for more activities and events during your visit.